This is a very busy week in Congress and a crucial one in our fight to preserve the H-2B program. Earlier today, the Senate passed a Hurricane Harvey relief package that also raises the debt ceiling and continues existing government funding through December 8. The House is expected to pass the measure shortly. Under this legislation, the existing provisions of law related to H-2B wage surveys, staggered crossing for seafood workers, prohibitions on DOL enforcement of the H-2B corresponding employment and ¾ guarantee regulatory requirements and a 10-month season will be continued through December 8, but the Homeland Security Secretary’s authority to increase H-2B visas is still set to expire on October 1. The Department of Justice has struck down the final rule "Defining and Delimiting the Exemptions for Executive, Administrative, Professional, Outside Sales and Computer Employees under the Fair Labor Standards Act" published in 2016. The rule would have extended overtime pay for an estimated four million American workers by nearly doubling the annual salary threshold of eligibility. Congress is on recess through Labor Day and shortly after returning to Washington, lawmakers will take up fiscal 2018 spending bills for the Department of Homeland Security (DHS) and other federal agencies. We urgently need your help to get H-2B cap relief included in the spending bill. Cap relief was not included in the DHS appropriations bill passed by the House Appropriations Committee earlier this summer. We need it included in the manager’s (chairmen’s) amendment to the bill before the bill comes to the House floor for a vote. Congress is on recess through Labor Day. Please use this month to reach out to your lawmakers while they are home from Washington. Consider attending a town hall meeting or making an appointment to see your Senators and Representative in their in-state offices. Please continue to stress the need for permanent H-2B cap relief. WASHINGTON — U.S. businesses in danger of suffering irreparable harm due to a lack of available temporary nonagricultural workers will be able to hire up to 15,000 additional temporary nonagricultural workers under the H-2B program under a final rule that the Departments of Homeland Security and Labor submitted to the Federal Register today. To qualify for the additional visas, petitioners must attest, under penalty of perjury, that their business is likely to suffer irreparable harm if it cannot employ H-2B nonimmigrant workers during fiscal year (FY) 2017. An interim final rule to increase the number of H-2B visas is reportedly being reviewed by the Office of Management and Budget. We are hopeful that this regulation will be issued shortly. 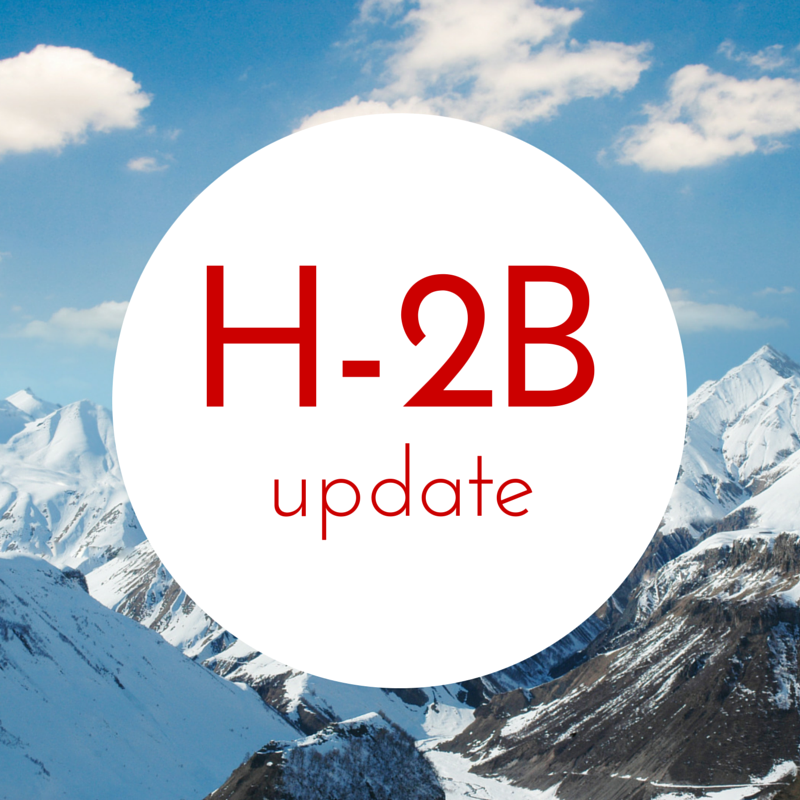 In late June, a Department of Homeland Security (DHS) spokesperson announced that Secretary John Kelly would soon expand the number of H-2B visas available this fiscal year, as is authorized under the fiscal 2017 Consolidated Appropriations Act. DHS spokesperson David Lapan qualified the statement, however, by stating that Secretary Kelly would make a small number of visas available in late July to a limited number of businesses that would be "severely harmed" without an immediate influx of H-2B workers. WASHINGTON, D.C. – U.S. Senators Susan Collins and Angus King have signed onto a bipartisan letter led by Senator Tom Carper (D-Del.) to Department of Homeland Security (DHS) Secretary John Kelly urging him to use the authority provided by Congress to lift the cap on seasonal H-2B visas that employers rely on to fill summer jobs. In the letter, the senators expressed their concern about reports that visas may not be approved in time for peak tourist season. As you know, pyrethroids play an important role in lawn care and landscape management, but the use of these products could be severely restricted as part of EPA’s review of this class of chemistry. Please see the article below from the Washington Times, regarding an announcement today by Homeland Security Secretary Kelly that DHS will approve a limited number of H-2B visas soon. We do not have any information beyond these press reports but will watch the situation and report any details as we learn them. Pyrethroids are under threat and we need landscape professionals to lend their voice in support of common sense regulations. Currently the EPA is evaluating whether to further restrict pyrethroid use by landscape professionals. As you know, inappropriate regulations can significantly impact your lives and livelihood, and we need you to help the EPA better understand the important role that pyrethroids serve in your ability to provide your services and protect the public. Any new and onerous requirements placed on these products are sure to have a negative impact on your bottom line and your ability to provide your customers with service using products that have been proven to be safe and effective. If you don't participate in the below grassroots campaign and have your voice heard, onerous risk mitigation measures that may limit the way these products can be used are a real possibility. Together, let's ensure that as professionals we preserve opportunities that ensure choice when it comes to determining the right tools necessary to do our jobs. With a just few clicks, you can educate the EPA on the benefits of pyrethroids for protecting public health and property. With your help, we can affect the outcome and save these products! Click Here: Save Pyrethroids From Extreme Risk Mitigation! NALP: "DHS Secretary Comments Cloud H-2B Cap-Relief"
Read the full report at NALP's blog. As you know, President Trump signed the Consolidated Appropriations Act of 2017 into law on Friday. The law allows the Secretary of Homeland Security, in consultation with the Secretary of Labor, to approve additional H-2B visas. The President signing the law was a wonderful first step, but we now need to convince DHS to quickly implement this provision of law and immediately resume H-2B processing. We need your help.